A natural antipathy of grease to water is the basis of original lithography. A drawing is made on a limestone (or a specially grained zinc or aluminium plate) with greasy ink or a grease crayon. The image is then “etched” into the stone surface with a diluted mixture of acid and gum arabic, which is not strong enough to eat into the stone, but which increases the stone’s poracity, therefore its ability to attract water. 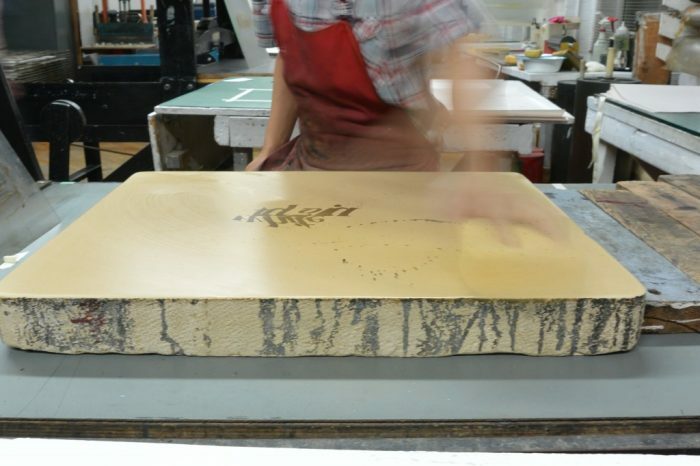 When ink is applied, with the use of large rubber rollers, it sticks to the greasy image areas, and is repelled by a film of water over the non-image areas. Then, when a sheet of paper is applied over the inked surface, and “pulled” through a lithographic press, ink is transferred from the image areas onto the paper in a mirror image. The stone must then be re-inked for each subsequent print. For additional colours separate stones are individually drawn on and prepared. The stone may be used again once the surface has been ground down to remove the image.